Solar Powered & Durable — Flexible Copper Wire Lights – can be easily bended and molded into to any shapes you desire. Low voltage power and non plug-in. Easy to Use — 2 buttons to control. One for power on/off, and another for 2 modes to choose steady/flashing. Put under sunlight during the day, and it begins to light up at night automatically when power on. Waterproof — the lights are suitable for Indoor and Outdoor decorations, because of the lights and the solar panel are both waterproof. Special Decoration Effects — live, Love, Create, add a warm and charming atmosphere for your Christmas decorations,home, patio, lawn, garden, shop, bar, café, restaurant, balcony, walkways, pergola canopy, and more. Note — The solar panel must remain directly exposed to sunshine for a whole day to conserve sufficient solar power before first use. Solar panel with ground stake for easy setting. Low voltage power and non plug-in. 1. During the daytime, solar panel converses solar energy and converts it to electrical power stored in the rechargeable battery. 2. The battery release the energy as lighting power when it’s dark enough. 3. There is a rechargeable battery in solar box, which is durable, can be easily replaced. 4. When you find your lighting effective time is getting too short or dimming, it is recommended that you replace the battery. 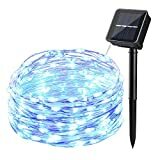 1 x Icicle 120 LED Solar String Lights. 1 x 0.4 inch(20cm) Ground Stake.